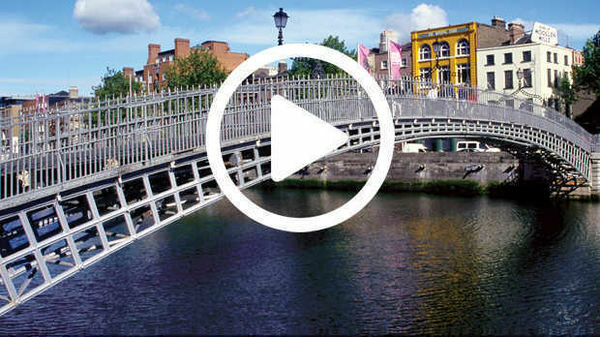 In this program we tour bustling Belfast's City Hall and Ulster Museum, then head out to Northern Ireland's favorite resort: Portrush, along the Antrim Coast, where we taste-test Irish whiskey, scramble over some six-sided geology in the Giant's Causeway, drop in on a world-class golf course, and stomp our feet to some traditional music. This grand structure's 173-foot-tall copper dome dominates the town center. Take a close look at the Queen Victoria monument and how it celebrates the industrial might of Belfast: shipping, linen (the woman with the bobbin), and education (the student). A worthwhile, 16-room Belfast History and Culture Exhibit fills the ground floor. It covers the history of the city, culture, industry, the WWII bombings, and the Troubles. Facing the building, if you go around to the left, you’ll find the Titanic Memorial Garden. If you can't manage a tour, at least step inside to admire the marble swirl staircase and the view up into the dome. This is Belfast's most venerable museum. The five-floor museum is free and pretty painless, and offers an earnest and occasionally thought-provoking look at the region's history, with a cross-section of local artifacts. The top two floors are dedicated to rotating art exhibits, the next floor down covers local nature, and the two below that focuses on history. The ground floor covers the Troubles. Any cab goes up Falls Road, past Sinn Fein headquarters and lots of murals, to the Milltown Cemetery (£6, sit in front and talk to the cabbie). Hop in and out. Easy-to-flag-down cabs run every minute or so in each direction on Falls Road. Or take a one-hour tour with one of the 40 trained cabbies offering them (cheap for small groups, best views with 5 or fewer riders). Located just below the train station on Portrush's harbor, Barry's is filled with "candy floss" (cotton candy) stands and ) and crazy “scoop treats.” Older locals visit for the nostalgia as many of the rides and amusements go back 50 years. Irish courses, like those in Scotland, are highly sought after for their lush greens in glorious settings. Serious golfers can get a tee time at the Royal Portrush, which hosted the British Open in 1951 and is set to host it again in 2019. Those on a budget can play the adjacent, slightly shorter Valley Course. This is a salty, modern place with an inviting menu, ranging from steaks to vegetarian food. It’s very casual but with serious cuisine. Distillery tours waft you through the process, making it clear that Irish whiskey is triple distilled — and therefore smoother than Scotch whisky (distilled merely twice and minus the "e"). Tours start with the mash pit, which is filled with a porridge that eventually becomes whiskey. You’ll see a huge room full of whiskey aging in oak casks – casks already used to make bourbon, sherry, and port. Visitors get a single glass of their choice. To see the distillery at its lively best, visit when the 100 workers are staffing the machinery — Monday morning through Friday noon (the still is still on weekends and in July, when the machinery is shut down for annual maintenance). Tours are limited to 30 people and book up. In summer, call ahead to put in your name and get a tour time (+44 (0)28/2073-3218). The causeway itself — the highlight of the entire coast — is free and always open. If you pay to enter the visitors center, you can borrow a great little audioguide to take along on your hike. (The visitors center's interactive exhibits give a worthwhile history of the Giant's Causeway.) You can visit the causeway either by shuttle bus (4/hour from 9:00, £1 each way) or on foot (10 minutes from the visitors center to the first viewpoint, 15 level minutes farther to reach the Shepherd's Steps). The only inhabited island off the coast of Northern Ireland, Rathlin is a quiet haven for hikers, birdwatchers, and seal spotters. Less than seven miles from end to end, this "L"-shaped island is reachable by a passenger-only ferry from the town of Ballycastle. While it's one of the largest castles in Northern Ireland and is beautifully situated, there's precious little left to see among Dunluce's broken walls. Before entering, catch the eight-minute video about the history of the castle (across from the ticket desk). The ruins themselves are dotted with plaques that show interesting artists' renditions of how the place would have looked 400 years ago. Hi, I'm Rick Steves back with more of the Best of Europe. This time we're really on the edge…stay with us as we explore the best of Northern Ireland. As far as I'm concerned, no trip to Ireland is really complete without visiting Northern Ireland. Sure it's had its Troubles — and we'll check out some powerful political sights — but there's so much more. Northern Ireland comes with the same friendly people and lush scenery you'd expect to find anywhere on the Emerald Isle…and there're no tourist crowds. We'll tour bustling Belfast, sneak a peak at its more politicized sectarian neighborhoods, go wild in the Ulster Coney Island, and taste test Irish whiskey. We'll scramble over some six-sided geology, tee off on a world-class golf course, and stomp our feet to some traditional music. Northern Ireland is part of a group of islands called the British Isles, and part of a political entity called the United Kingdom. The Emerald Isle is comprised of the independent Republic of Ireland and Northern Ireland. The Northern region is also called "Ulster." 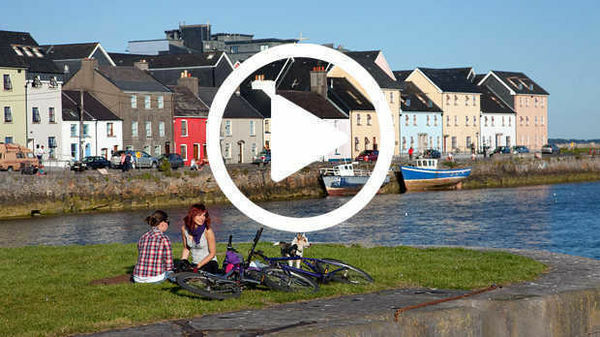 From the capital, Belfast, we travel to fun-loving Portrush, to the rough-and-tumble city of Derry, and enjoy attractions along the Antrim Coast. Here in Northern Ireland, sightseeing makes more sense with a little background. All of Ireland was once ruled by Britain. But the Irish didn't assimilate quite according to plan. While Britain was Protestant, most of the Irish were Catholic — and with these religious differences came a deep-seated cultural divide. To help bolster its control, London planted settlers — Protestant settlers, mostly from Scotland. These people became the "Scots Irish" — the dominant ethnic group in North Ireland today. But centuries of British rule led to strife, and in the 1920s, after a bloody war, most of Ireland became an independent country — Catholic, and ruled from Dublin. But the North — with its Protestant majority — opted to stay with Britain. And the island remains divided to this day. You'll see symbols of that division throughout Northern Ireland. Protestant "Orange parades" are common. Several thousand a year during marching season — between Easter and early September — fill the streets with sectarian pageantry. While 90 percent of these parade through Protestant towns, and are therefore peaceful, a few are antagonistic — marching through Catholic towns and neighborhoods. Far more political than your average parade, these are like pep rallies for the cause of continued Union with Britain…a chance for parents to share their political passions with their kids. The long-established Orange Order works to defend the union with Britain — so their political philosophy is "Unionist." Orange is the team color and the Union Jack is its flag. This is countered on the Catholic side by Nationalists and Republicans — people who want the entire island to be one nation. Their color is green, and they fly the Irish flag. In the Republic of Ireland, there's no question — Catholics rule. But here in the Protestant-dominated North, the Catholics — with over a third of the population — are just too big a minority to ignore. In order to maintain control, Protestants employed policies that were tough on Catholics. This escalated tensions, which led to the Troubles, which have filled headlines around here since the late 1960s. As Protestants and Catholics clashed, the British Army entered the fray, and they've been here ever since. Thankfully real progress toward peace has been made recently and, while you still don't want to sing Protestant songs in a Catholic pub like this — or vice versa — Northern Ireland has become a great place to visit. Belfast, just a couple hours north of Dublin, straddles the Lagan River. It was only a village in the 17th century. But with the influx of Scottish and English settlers and the Industrial Revolution, which took root with a vengeance here, Belfast boomed. While the rest of Ireland remained rural and agricultural, Belfast was nicknamed "Old Smoke" — shipbuilding was huge. This slipway was the birthplace of the Titanic — and many ships that didn't sink. The neighboring dry dock is where that ill-fated ship — the biggest man-made moving object of its day — was outfitted. Nearby, two huge cranes (once the biggest in the world, nicknamed "Samson and Goliath") rise like skyscrapers above the harbor — another reminder of this town's former shipbuilding might. In 1888 Queen Victoria granted city status to this boomtown of 300,000, and soon after, its citizens built Belfast's centerpiece: City Hall. With its statue of Queen Victoria scowling down Belfast's main drag and the Union Jack flapping behind her, it's a stirring sight. Queen's University is also from the illustrious reign of Victoria. Its back yard is an inviting public park — particularly relaxing on a sunny summer afternoon. The palm house — an early example of an iron and glass greenhouse dating from the mid-1800s — gives you a lush and humid jungle experience right in Belfast. Also in the garden is the Ulster Museum — the city's one major museum. You'll find a fascinating "Made in Belfast" exhibit under an arch proclaiming, "Trade is the golden girdle of the globe." Exhibits explain how Belfast thrived in its glory days. The linen industry employed thousands. Belfast workers made products from flax like canvas and rope, which contributed mightily to maritime commerce. Massive ships — made in Belfast — were commonplace from Seattle to Shanghai. It feels like a new morning in Belfast. It's hard to imagine that this bright and bustling commercial center was once a tense and subdued security zone. Today there's no hint of security checks — not long ago, a tiresome daily routine. Still, it's a fragile peace — especially evident in the working-class Catholic and Protestant neighborhoods. Mean-spirited murals and pubs with security gates are reminders that the island is split, and a dwindling — yet still substantial — number of extremists prefer it that way. These flag waving hotbeds of the Troubles have become tourist attractions to many curious visitors. The best way to get around Belfast is by cab. And your ride can come with an education. For a reasonable hourly fee, many cabbies give visitors impromptu tours. My guide, Norman, is sharing some personal insights. Rick: Norman, can you explain to me just in general about sectarian neighborhoods? Norman: Sectarian neighborhoods are within the working class areas, and the working class areas only, where they keep divided because of, well, the hatred for each other and of course what they've done to each other through terrorism. Falls Road is a well-known Republican stronghold in the west part of Belfast. Rick: So, this is the Catholic neighborhood then, huh? Norman: Well, it's more known for being Republican, rather than just Catholic. Rick: OK, so why is it so famous? Norman: Because of the amount of trouble that happened here between the IRA and the British soldiers and the police force and so on. Rick: It feels safe today. Norman: Well, things have changed over the last five years. Rick: But there are these symbols of the sectarianism that still are strong, aren't they? Norman: Very strong, and will remain to be strong because of the backgrounds within the conflict. Murals are an art form — and they come with a strong political message. "Ireland will rise like a phoenix," "Ireland should be free and united"…and so on. Police stations stand like fortresses. And everywhere in this Catholic neighborhood, the Republican cause is honored. An important stop along Falls Road is the Milltown Cemetery, where Gaelic crosses allow Catholic Republicans to make a statement in death and where IRA fighters are buried with the honor of fallen soldiers. Rick: So, tell me about this place. Norman: It's a Catholic cemetery, with also some Republican attachment to it — a lot of Republican people buried, as well as Catholics, of course. And this is a typical cross, with Irish design on, of course, which is extremely important, showing a typical Irish background. The most visited gravesite here — set apart by little green railings — commemorates IRA heroes. Among many others, it remembers Bobby Sands and nine other hunger strikers. They starved themselves to death in a nearby prison in 1981. They wanted to be treated as political prisoners rather than criminal terrorists. Norman: It hasn't always been Catholics against Protestants. It's been people of more the extremists within the religions, where the moderates, both Catholics and Protestants, have not supported the actions of either Loyalism or Republicanism. Loyalists are the extremists of Protestants. Republicans are the extremists of Catholics. So the moderate parties are known as Unionists, which are moderate Protestants, and Nationalists, which are moderate Catholics. Rick: So, there are a lot of moderates, actually then, that aren't at each other's throats. Norman: The majority of people in Northern Ireland are the moderates. A bleak wall separates the Catholic Republicans of the Falls Road area from the Protestant Loyalists in the Shankill Road area. It's called the "Peace Line" because without it there would be no peace. But progress is being made. In a promising change, after 30 years of being closed, this gate is now open, connecting the two neighborhoods. For a sampling of Unionist passion, you can explore this working-class Protestant neighborhood. Murals on Shankill Road promote the Unionist or loyalist cause. There's lots of symbolism. Every time I visit, locals stress it's not Protestants fighting Catholics. It's extremist Loyalists, who happen to be Protestant, fighting extremist Republicans, who happen to be Catholic. These extremists are the people who are proud to live in sectarian neighborhoods, and it's these extremists who fan the persistent flames of Ireland's Troubles. The big hope now is for a new generation to be raised without the extremism of the past. Children playing together here are both Catholics and Protestants — part of a summer-camp program giving kids from both communities reasons to live together rather than apart. About an hour's drive from Belfast takes us to Northern Ireland's favorite resort — Portrush. This is the playground of Ulster, and an ideal base for exploring the highlights of the Antrim Coast. Portrush has long been the "Coney Island" of Ireland's north. Its architecture retains the atmosphere of a genteel seaside resort. Portrush fills its peninsula with family-oriented amusements, fun eateries, and cheap and cheery bed-and-breakfasts. Summertime fun-seekers promenade along the toy harbor and tumble down to the sandy beaches, which extend in sweeping white crescents on either side. Barry's Old Time Amusement Arcade is a fine chance to see Northern Ireland at play. While some do the loop-de-loop, others mellow out on the Bowling Green. Or, maybe you'd rather go golfing. Serious golfers can get a tee time at the Royal Portrush. Irish golf courses, like those in Scotland, are highly sought out by people who know the game. Golfer: Royal Portrush golf club is one of the best links golf courses in Britain, so, like all the links golf courses, it's dry, tough, breezy, and very enjoyable. Rick: So, what is a "links golf course"? Golfer: Well, the best links golf course is running against the sea, and we have an expression that the links is the piece of ground that links the land to the sea. Links golf courses are a sand-based golf course — they're dry and running on, like, park land that may have a lot of water and trees and bushes. It's all sort of just rough grass and hard lies and that's it. Rick: A reason to travel to Ireland, then? Golfer: It's a great reason to come to Ireland. I dig my divots next door at the pitch-and-putt range. You get two clubs and balls for just a couple pounds. Rookies young and old share the same glorious setting and turf with — who knows — perhaps a champ in the making…or perhaps not. Ireland and Britain are no longer bastions of terrible food. The Ramore Wine Bar offers an inviting menu you wouldn't have found anywhere in Ireland a decade or two ago. Everything from crab to steaks to vegetarian at a reasonable price. And a glass of wine is a welcome break after all that beer. Here in Northern Ireland as in the rest of Britain, bed-and-breakfast places offer a fine budget value. Bedrooms are as comfy as a hotel's, but feel like home. The inviting lounge makes you feel like part of the family. And the included breakfast is hardy, and comes with a chance to meet the other guests. An hour's drive from Portrush, the town of Londonderry — also known as Derry — is the "second city" of Ulster. Its characteristic streets are inviting and the town's hard fought history is evident in its formidable wall. Like Belfast, Derry comes with all the security trappings. Stephen McPhilemy — a Derry guide — is joining us. Years ago he showed my tour group his hometown. Steven was so good, he now leads my Ireland tours. Rick: Stephen, tell me about the political lay of the land. Stephen: OK, everything that's in the background that's green is the Republic of Ireland, and the River Foyle, which is in front of us, is the natural boundary between Northern Ireland, which is on this side, and the Republic of Ireland, which is on that side. But in 1921, when the British were dividing our country, they wanted to hand this city over to the new Irish Free State, but the Protestant community here did not want that. They wanted to keep the city for sentimental reasons. So the River Foyle is the natural boundary, or the border, until it comes to the urban area. Then it sweeps around and encompasses the urban area, and then it becomes the river again — the border is the river again at the end of the city. Physically, the city is joined with the Republic of Ireland, but politically it's in Northern Ireland, and that's why it been such a hotbed of political turmoil ever since the Troubles started back in 1969. Rick: Now you called it Londonderry or Derry? Stephen: To the Protestant community it's very proudly "Londonderry." No Catholics in the city would accept that term — never call it "Londonderry." To the Catholic here, it's always "Derry." Derry is the finest walled town in all Ireland — and visitors are free to walk the ramparts. Stephen: The walls were built in 1613 by Protestant colonists from the city of London to keep themselves safe from the native Irish Catholics who would have been all around here, surrounding the city. This would have been hostile territory for the new Protestant colonists. Rick: OK, so about 400 years ago English settlers behind these walls, everywhere out here. Stephen: Yes, native Irish Catholics, all around the city, up in the highlands, the hills, the valleys, the glens. Rick: What an incredible wall, really. Stephen: Yeah, we're very proud of them, Rick. It's our little claim to fame — we're the only completely walled city in Ireland, or Britain for that matter. A great thing about Catholic pubs: traditional Irish music. On a single day out from Portrush, we'll enjoy a whiskey distillery, a geological wonder, a bouncy rope bridge, and a ruined castle. And it's all along a stunning coast line. The Antrim Coast is one of the most popular and scenic drives in the whole of Ireland. Homesteads are pristine. A short drive through this idyllic farm country makes it clear: tidiness is a Scots-Irish forte. 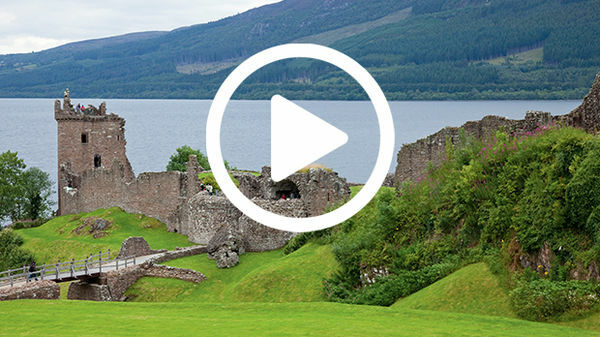 Visitors explore desolate trails, evocative castle ruins, and dramatic beaches. The Antrim Coast is a popular vacation getaway from Belfast. A road trip here comes with fine surprises, like "show off your horse day" at the local riding club. Build a little slack into your itinerary so you can actually stop and check out the action. Antrim towns like Bushmills are Scots Irish and decorated strictly Protestant. And this town is home to a famous whiskey. Bushmills claims to be the world's oldest distillery. They've been making it here since the 13th century. Guests are welcome, and tours finish here, in the tasting room. Irish whiskey makers brag that their whiskey is triple distilled — and therefore smoother than Scotch whisky. Those taking the distillery tour learn this emphatically during the tasting. Four volunteers per tour get to taste test eight different whiskeys. Distillery tour guide: As you'll come to the Scotch and the Irish, the Scotch, as I've told you before, it is only double distilled, where the Irish is triple distilled… Congratulations, fully-qualified Irish whiskey taster. Guide: There we are. Thank you. The leading attraction along the coast is the Giant's Causeway, a four-mile-long stretch of shoreline famous for its bizarre rock columns. The shore is covered with hexagonal pillars that stick up at various heights. It's as if earth is offering God his choice of 37,000 six-sided cigarettes. This was a big stop for 19th-century tourists. Early guides gave nicknames to the peculiar formations like the "Pipe Organ" and the the "Wishing Chair." Geologists claim the Giant's Causeway was formed by volcanic eruptions 60 million years ago. As the lava surface cooled, it contracted and cracked into hexagonal shapes. And as the layer of hardened but alligatored rock settled, it broke into its many stair steps. Rick: So, the scientists say this is a geological formation. Stephen: Aye, but nobody here actually believes that, Rick. We believe this was built by giants, 2,000 years ago — the great Finn McCool, a local champion, against the Scottish pretender, Benandonner, who lived over here in the Mull of Kintire. So the Scots guy decides to build a causeway across the ocean here, 12 miles, instead of coming by boat. He comes across on his causeway, he plunders and pillages a little bit here. Our champion, Finn McCool, was a little bit nervous, because of the fact that the Celts fought champion to champion, not necessarily army to army. So his wife decides to build a cradle that's about seven feet long. She dresses him up like a little baby, and puts him in the wee cradle — this is Ulster's hardest man — the Scots guy comes across, gets into the castle, grabs his wife and says, "I'm gonna kill your husband." And she said to him, "Shh! If you don't be quiet, you're going to wake my wee baby! And if you wake my baby, then his father's going to be very, very angry." And the Scottish guy looks around, sees that the baby's actually seven foot long, and is terrified. And he thinks, "Oh my God, if the baby is seven foot long, then the father's going to be absolutely massive!" So instead of waiting around to meet the Irish father, he runs the whole way back to Scotland, and gets the soldiers to pull up the causeway and dump it in the ocean behind him. And the proof of that story is what we're standing on right now today. Giants or geology — you decide. Either way, the Giants Causeway is well worth a stop. A few miles farther up the coast is a bridge you can cross. For a great little hike, a powerful dose of Ulster nature, and a few butterflies in your stomach, follow the trail to the Carrick-a-Rede Rope Bridge. For 200 years fishermen have strung a skinny bridge across a chasm between the mainland and a tiny island. Woman: Sacred Heart! There should be a bar over here! Rick: I'm still kind of queasy. This is the rope bridge of any kid's dreams. Rick: So the bridge was actually built by fishermen. Stephen: Yeah. Well you see, this time of year, crowds of big, fat salmon are going around the coast here to get back to spawn in the rivers. So two centuries ago, the fishermen realized this was the best place to catch them — so their nets are here just off the island. So to get to the island, the rope bridge was built. Rick: It's an incredible perch. Stephen: Yeah, the birds love it. It's one great, big bird sanctuary up here, pretty much. I meet bird watchers from all over the world who come over here to see what's going on, to look at the birds — look at the gulls, the gannets, the razorbills. The biggest puffin sanctuary in Europe is behind us here on Rathlin Island. The romantic ruins of Dunluce Castle, perched dramatically on the edge of a rocky headland, are a testimony to this region's turbulent past. Local guides are expert at bringing the ruins to life. Rick: So, this was the home of a noble family? Guide: This was the home of the McDonnell family, who originated in Scotland. They came over here and worked their way to the top of the tree, socially. And this is where they had their base. Rick: This big room here? Guide: Yes, this large hall was built about the 1620s, and this is where the McDonnell earls, the earls of Antrim now, wined and dined and entertained their guests. Rick: So, this is more than a windy fortress? Guide: Yes, this was actually a very luxuriously appointed palace by the sea. They had tapestries on their walls, possibly wood paneling. They had real Persian carpets on their floors. They had fancy imported European furniture, and an Irish harp for entertaining for musical evenings after dinner. Rick: Very nice. I can imagine a harp here. During the Middle Ages Dunluce resisted several sieges. But then on a stormy night in 1639, dinner was interrupted as this end of the castle crashed into the sea, took the kitchen and several servants with it. The lady of the house, who didn't like living on this windy bluff anyway, said "That's it." She packed up and moved inland — abandoning Dunluce Castle to the forces of nature. Northern Ireland: from it' blossoming capital stained with sectarian struggles to its Coney Island and natural playgrounds, its geological wonders, and its ongoing challenges is a rewarding part of any Emerald Isle experience. I hope you've enjoyed our look at the best of Northern Ireland. Thanks for joining us. I'm Rick Steves. Until next time, keep on travelin'.